Type location Zaïre (Camponotus (Myrmoturba) Roubaudi Santschi var. agonia, n. var., Santschi, 1915c: 282, worker only; raised to species by Santschi, 1926b: 252) collected at Lugombe, by Gérard; worker only described (see Bolton, 1995) . 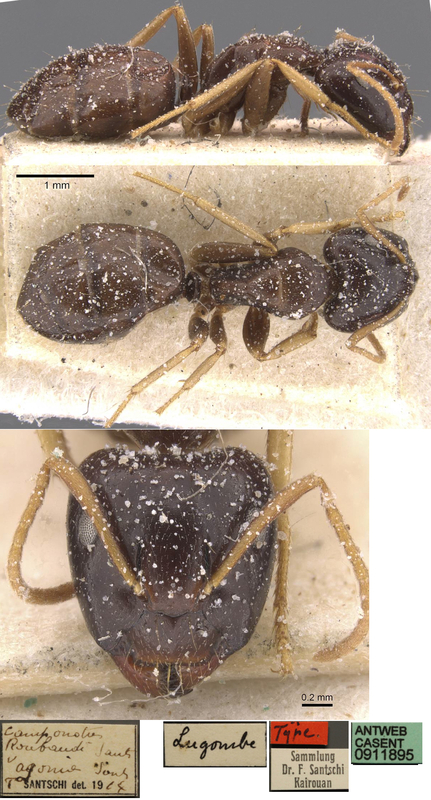 Santschi's (1915c) description is at - the comparison and illustration is with Camponotus roubaudi. 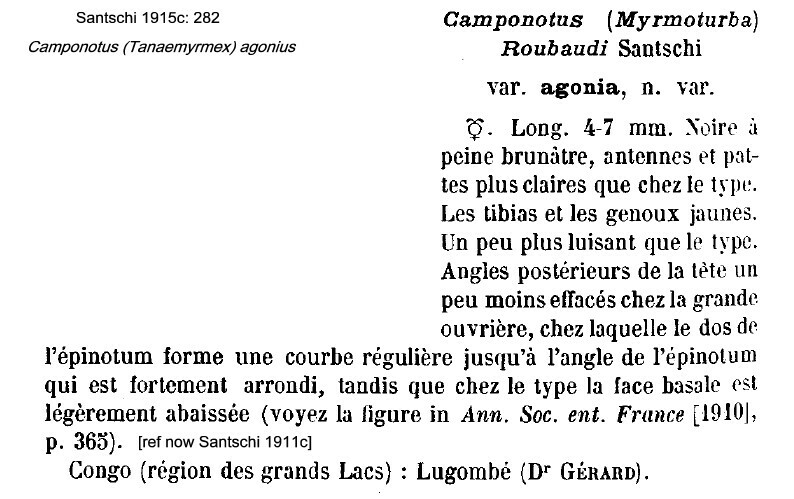 Santschi's (1915c) description, regarding it only as a new variety, was a brief comparison with Camponotus roubaudi. TL 4-7 mm. Posterior angles of head a little less effaced in the major. In profile, dorsum of propodeum in major a smooth curve, to the angle with the declivity, which is strongly rounded - in roubaudi the propodeal dorsum is slightly lowered. Black or slightly brownish; antennae and lower legs clearer; tibiae and knees yellow, slightly more shiny. Specimen from Zaïre, Great Lakes Region, at Lugombé, by Dr Gérard. Santschi (1926b), when relegating C. (Myrmamblys) chapini Wheeler (1922) to status of a variety of "C. (Myrmamblys) agonias Santschi"), noted the appendages are reddish yellow and raised it to species status as the propodeum was distinctly different to C. roubaudi, where the propodeum profile is angular. Bernard (1952) noted that the designation of this species, which he noted as "= chapini var. agonius Wheeler, = roubaudi var. 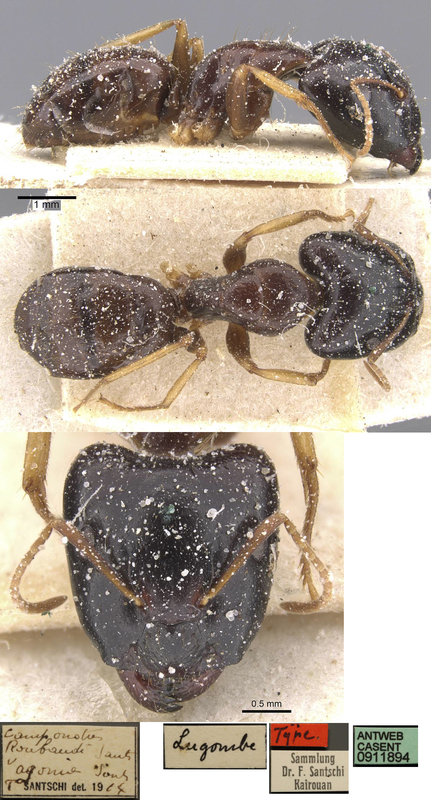 agonius Santschi", by authors was varied on this small species, with characteristics of Tanaemyrmex and Myrmamblys. In Guinea it seemed Lamotte found two nests, one at F 159, the other at F 204, both in savanna at Ziéla; cited from Gabon and Congo, seemingly rare. The photomontage of the type major is collated from http://www.antweb.org/specimen.do?name=casent0911894. The photomontage of the type minor is collated from http://www.antweb.org/specimen.do?name=casent0911895.